It's Monday and it's Katrina here on the Rubber Cafe blog today. I cannot believe the month is almost over and it's almost time for another Creative Cafe kit! You can get so many cards out of these kits, I am totally impressed! Today I am sharing a watercolor/embossing technique for my card. The card I made for today is PERFECT for sending thru the mail, because it's not too bulky at all. Most of the time, my cards are too bulky! 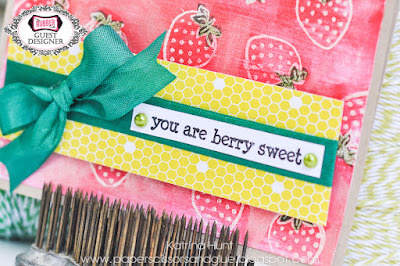 I used the Farm Fresh add on stamp set for this card. I started of by cutting my 8.5 x 11 inch piece of khaki cardstock in half, straight down the middle of the shorter side. I then cut a piece of the white cardstock 4 x 5.25 inches. Using Versamark ink, I stamped the single strawberry all over my white cardstock. I stamped randomly, not in any particular pattern. I covered all the strawberries with white embossing powder and then heat embossed. 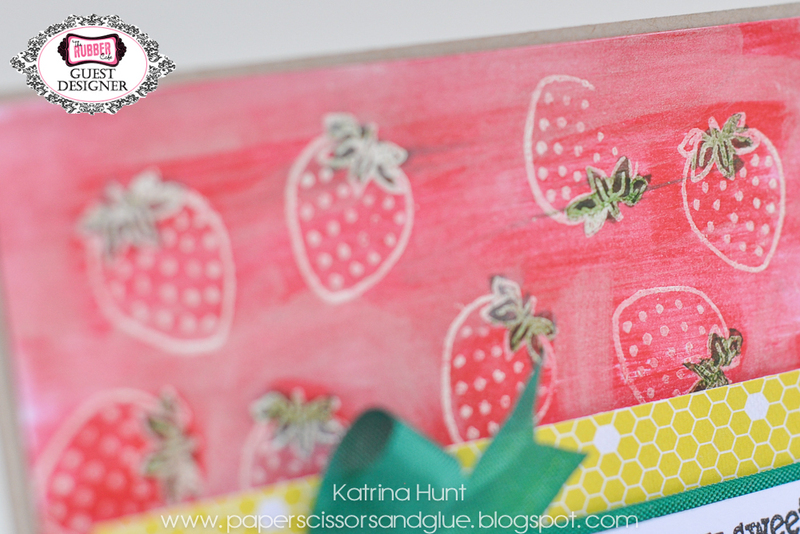 Using a red color from my Zig Gansai Watercolors, I painted over the entire sheet that I embossed the strawberries on. If the color get too strong in an area, you can just take a wet brush and blend into a nearby area. Before everything dried, I daubed with a paper towel, to get the color off the white embossed areas. I decided to add some green to the leaves and then I ran some of the pearlescent watercolor paint over the entire layer also. I had a strip of the yellow honeycomb paper left over from my previous card that fit the front perfectly! I added the green seam binding. Tip, if you have trouble with bows looking pretty make them separately! I just ran a strip of the seam binding across my paper and then attached the ends at the back. I made the bow separately and then attach with a liquid adhesive. This lets you fuss with the bow until it is the way you want it! I stamped the sentiment on a strip of white and then added some of the gem to complete the look. The only thing that I used foam adhesive for was to pop up the yellow pattern paper. This is a fun way to use those "single" stamps in sets! The bananas in the set would look awesome like this also! I think I may try that next!! Have a great week!